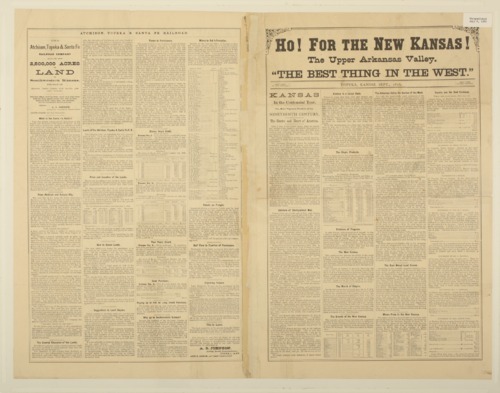 Promotional flier featuring a map of Kansas titled, "The Finest Climate and Most Prolific Soil in the West." Map depicts the land granted to the Atchison, Topeka, & Santa Fe Rail Road by the U.S. government to encourage the development of railroads in the West. Shaded areas on the map indicate lands for sale by the railroad along the Arkansas River valley. Promotional text on both front and back markets the land to farmers as "the best wheat land known." It also includes detailed information on towns, schools, lumber, fruit growing, and livestock raising in the region.